With the world’s population expected to exceed nine billion by 2050, scientists are working to develop new ways to meet rising global demand for food, energy and water without increasing the strain on natural resources. Organizations including the World Bank and the U.N. Food and Agriculture Organization are calling for more innovation to address the links between these sectors, often referred to as the food-energy-water (FEW) nexus. Nanotechnology – designing ultrasmall particles – is now emerging as a promising way to promote plant growth and development. This idea is part of the evolving science of precision agriculture, in which farmers use technology to target their use of water, fertilizer and other inputs. Precision farming makes agriculture more sustainable because it reduces waste. We recently published results from research in which we used nanoparticles, synthesized in our laboratory, in place of conventional fertilizer to increase plant growth. In our study we successfully used zinc nanoparticles to increase the growth and yield of mung beans, which contain high amounts of protein and fiber and are widely grown for food in Asia. We believe this approach can reduce use of conventional fertilizer. Doing so will conserve natural mineral reserves and energy (making fertilizer is very energy-intensive) and reduce water contamination. It also can enhance plants’ nutritional values. Applying fertilizer the conventional way can waste resources and contribute to water pollution. Fertilizer provides nutrients that plants need in order to grow. Farmers typically apply it through soil, either by spreading it on fields or mixing it with irrigation water. A major portion of fertilizer applied this way gets lost in the environment and pollutes other ecosystems. For example, excess nitrogen and phosphorus fertilizers become “fixed” in soil: they form chemical bonds with other elements and become unavailable for plants to take up through their roots. Eventually rain washes the nitrogen and phosphorus into rivers, lakes and bays, where it can cause serious pollution problems. Fertilizer use worldwide is increasing along with global population growth. Currently farmers are using nearly 85 percent of the world’s total mined phosphorus as fertilizer, although plants can uptake only an estimated 42 percent of the phosphorus that is applied to soil. If these practices continue, the world’s supply of phosphorus could run out within the next 80 years, worsening nutrient pollution problems in the process. Phosphate mine near Flaming Gorge, Utah. In contrast to conventional fertilizer use, which involves many tons of inputs, nanotechnology focuses on small quantities. Nanoscale particles measure between 1 and 100 nanometers in at least one dimension. A nanometer is equivalent to one billionth of a meter; for perspective, a sheet of paper is about 100,000 nanometers thick. These particles have unique physical, chemical and structural features, which we can fine-tune through engineering. Many biological processes, such as the workings of cells, take place at the nano scale, and nanoparticles can influence these activities. Scientists are actively researching a range of metal and metal oxide nanoparticles, also known as nanofertilizer, for use in plant science and agriculture. These materials can be applied to plants through soil irrigation and/or sprayed onto their leaves. Studies suggest that applying nanoparticles to plant leaves is especially beneficial for the environment because they do not come in contact with soil. Since the particles are extremely small, plants absorb them more efficiently than via soil. We synthesized the nanoparticles in our lab and sprayed them through a customized nozzle that delivered a precise and consistent concentration to the plants. We chose to target zinc, which is a micronutrient that plants need to grow, but in far smaller quantities than phosphorus. 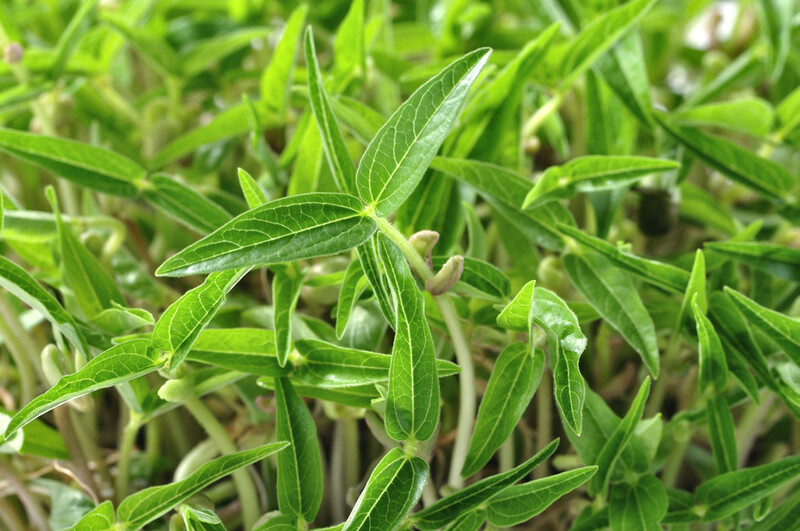 By applying nano zinc to mung bean leaves after 14 days of seed germination, we were able to increase the activity of three important enzymes within the plants: acid phosphatase, alkaline phosphatase and phytase. These enzymes react with complex phosphorus compounds in soil, converting them into forms that plants can take up easily. 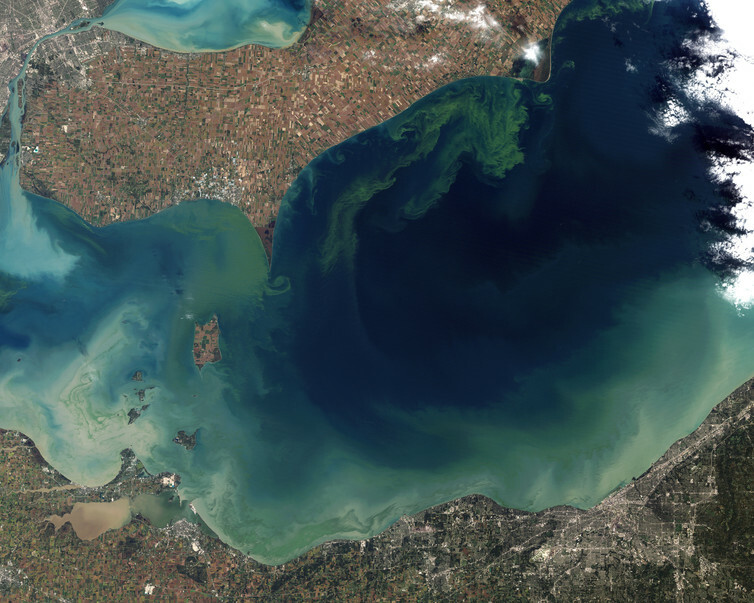 Algae bloom in Lake Erie in 2011, caused by phosphorus in runoff from surrounding farms. When we made these enzymes more active, the plants took up nearly 11 percent more phosphorus that was naturally present in the soil, without receiving any conventional phosphorous fertilization. The plants that we treated with zinc nanoparticles increased their biomass (growth) by 27 percent and produced 6 percent more beans than plants that we grew using typical farm practices but no fertilizer. Nanofertilizer also has the potential to increase plants’ nutritional value. In a separate study, we found that applying titanium dioxide and zinc oxide nanoparticles to tomato plants increased the amount of lycopene in the tomatoes by 80 to 113 percent, depending on the type of nanoparticles and concentration of dosages. This may happen because the nanoparticles increase plants’ photosynthesis rates and enable them to take up more nutrients. Lycopene is a naturally occurring red pigment that acts as an antioxidant and may prevent cell damage in humans who consume it. Making plants more nutrition-rich in this way could help to reduce malnutrition. The quantities of zinc that we applied were within the U.S. government’s recommended limits for zinc in foods. Nanotechnology research in agriculture is still at an early stage and evolving quickly. 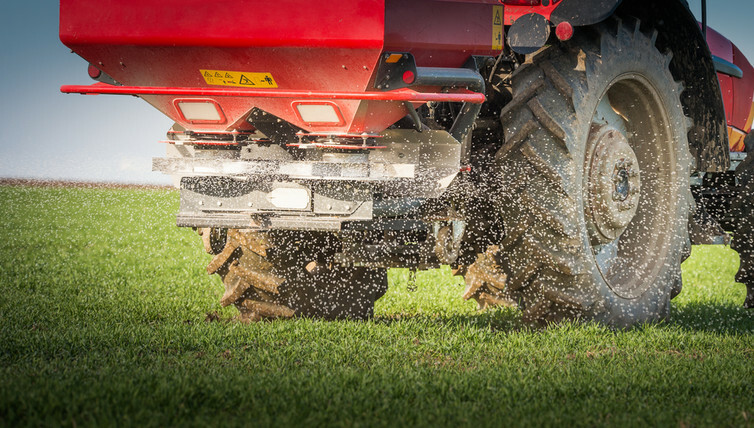 Before nanofertilizers can be used on farms, we will need a better understanding of how they work and regulations to ensure they will be used safely. The U.S. Food and Drug Administration has already issued guidance for the use of nanomaterials in animal feed. Manufacturers also are adding engineered nanoparticles to foods, personal care and other consumer products. Examples include silica nanoparticles in baby formula, titanium dioxide nanoparticles in powdered cake donuts, and other nanomaterials in paints, plastics, paper fibers, pharmaceuticals and toothpaste. Many properties influence whether nanoparticles pose risks to human health, including their size, shape, crystal phase, solubility, type of material, and the exposure and dosage concentration. Experts say that nanoparticles in food products on the market today are probably safe to eat, but this is an active research area. Addressing these questions will require further studies to understand how nanoparticles behave within the human body. We also need to carry out life cycle assessments of nanoparticles’ impact on human health and the environment, and develop ways to assess and manage any risks they may pose, as well as sustainable ways to manufacture them. However, as our research on nanofertilizer suggests, these materials could help solve some of the word’s most pressing resource problems at the food-energy-water nexus.